When an accident occurs, both parties involved must exchange information, so that when a determination of who is at fault is reached, the financial responsibility can be properly assigned and satisfied. However, when a driver flees the scene of an accident (hit-and-run) without leaving any personal information, a crime has been committed. The person who committed the hit-and-run as well as the victim(s) must take action following the offense. Indiana has passed specific legislation outlining the actions that must be taken after an accident, which makes a hit-and-run event a crime. Leaving the scene of an accident is a crime because, according to Indiana Code, any driver involved in an accident resulting in injury, death or entrapment in a vehicle must stop at the scene immediately. The law mandates each driver provide personal information (name, driver's license and information on vehicle, including insurance and registration), provide assistance to injured parties and/or facilitate transport to a hospital. Even if there are no personal injuries, if the accident has caused property damage, the drivers involved must exchange information. And, if there is more than $1,000 in property damage, the drivers must also report the accident to the local authorities. Is a Hit-and-Run a Felony? How Do I Get a Traffic Accident Report From the Florida Highway Patrol? Drivers who cause damage to other vehicles must also stop immediately and provide personal information. Indiana law has specific mandates for drivers who hit parked cars. The driver must stop immediately, according to Indiana Code. If the owner of the parked vehicle is not available, the driver of the vehicle causing damage must make efforts to find the owner, and after exhausting those efforts, leave their contact information and a statement about the accident. 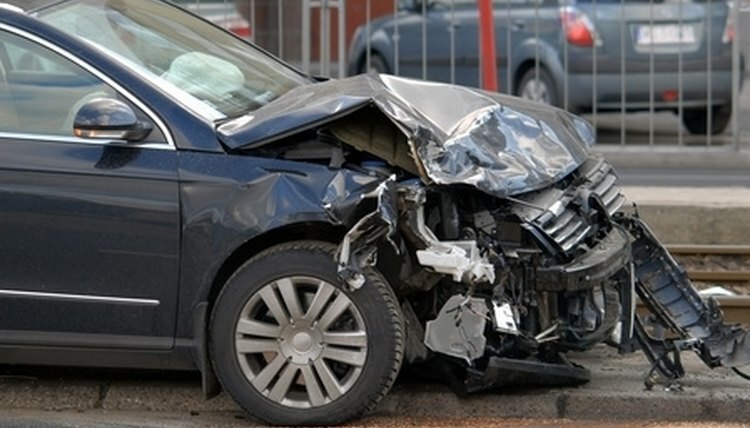 Leaving the scene of an accident because you are uninsured will compound the legal charges. Indiana state law requires all drivers to maintain a minimum of basic liability coverage with limits of $25,000/$50,000/$10,000, for bodily injury per person, total injuries and property damage respectively. A driver who commits a hit-and-run violation can be charged with a misdemeanor or a felony, depending on the injuries involved, according to the Indiana Code. The code refers to people who "knowingly or intentionally fail to stop." The penalties are more severe when a death is involved and/or if the driver causing the injuries and damage is intoxicated. Also, in a hit-and-run, if a report is not filed, the driver's license of the person who committed the hit-and-run can be revoked or suspended, even if the injuries and/or damages caused are minor. James, Darryl. "Indiana State Laws Regarding Hit and Run Accidents and Insurance." , https://legalbeagle.com/6899359-indiana-hit-run-accidents-insurance.html. Accessed 20 April 2019.